Fall is approaching and it’s my favorite style season of the year. The colors and ability to layer (without overheating) are two of the things I love most. The weather today in Memphis was wonderful which reminded me that fall is approaching. I decided to put a look together that meshing the diminishing summer heat along with popular fall colors. 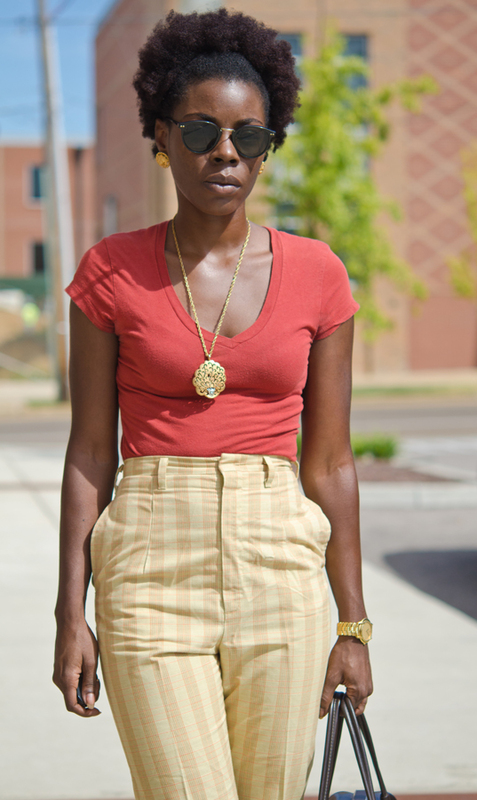 Using one of my personal style aesthetics, I updated vintage fashion into a modern look. I purchase these vintage cigarette pants a few months ago and fell in love with them as soon as I tried them on. They fit perfectly! I bought the Yves Saint Laurent sandals the same day…actually from the same location. A yard sale! Yes, I said a yard sale. Those who know me are aware of my love for shopping resale, whether it is thrift stores, estate, or yard sales. I lucked up of some awesome finds that day. The bag is also vintage. Last year, I noticed the comeback of doctor bags so of course I went out treasure hunting. This chocolate brown beauty is the perfect size, large enough to carry my wallet, all gadgets, make-up, and other personal items.